Chafing on the thighs is a common problem for exercisers due to the constant friction in this area, which can be an uncomfortable condition. Chafing on the thighs is a common problem for exercisers due to the constant friction in this area. This can cause the skin to become red and raw, which can be very uncomfortable. Chafing may also cause a burning or stinging feeling in the damaged area. If this condition is left unchecked, it can cause the skin to become severely damaged or make the skin more susceptible to infection. In some cases, chafed skin may break open or bleed due to the damage that has been done. You will need to take measures to help cure this condition and prevent it from occurring in the future in order to prevent doing severe damage to your skin. Here shows some conditions that make chafing thighs more likely. The most common cause of chafing in the thigh area is your clothing rubbing against the area. If you wear clothing that does not fit well, it can rub against the thigh as you move, causing irritation from the friction. 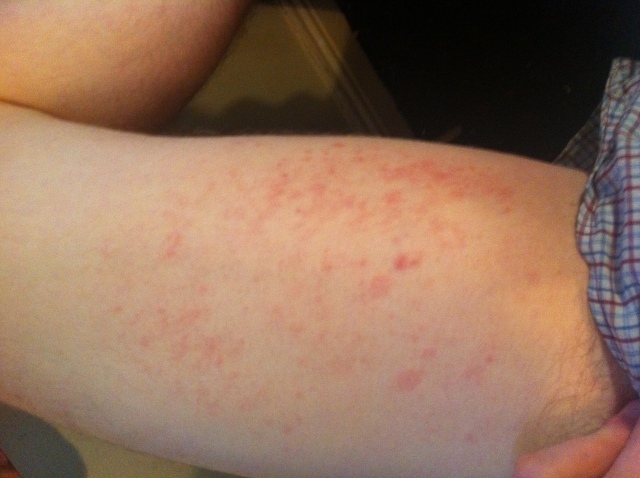 Clothing that is made from a coarse or scratchy fabric can also cause irritation that leads to chafing on the thigh. Some associate chafing with being overweight. If you are holding excess weight in the thighs, it can cause them to rub together, and the friction of the skin can cause chafing in the area. In this case, measures can be taken to help reduce the irritation, but the ultimate way to eliminate chafing issues will be to lose weight. When you are exercising, sweat can irritate the area and cause chafing. The salt from the sweat can become trapped in areas such as the thigh, which irritates the skin and increases the chance of chafing as the skin comes in contact with your clothing or skin. If you are susceptible to chafing, there are a few steps you can take to help prevent this condition from occurring. Gently clean the area to help remove and debris or sweat that might be contributing to the damage. Do not scrub and take care not to use water that is too warm as this can be painful on skin that is damaged. You will also want to use a soap that is gentle, preferably unscented so there are no extra ingredients that can add to your irritation. When you have thoroughly cleaned the area, you will need to apply a lubricant to help prevent your chafed thighs from becoming more irritated. Petroleum jelly, udder cream or balms are common choices for this task. You will need to choose a lubricant that is long lasting and can be used for multiple days in a row. Look for products that are non-staining so they are less likely to cause an allergic reaction or further irritation to your damaged skin. Once you have developed chafed thighs, it is important to avoid irritating the skin further while it heals. Avoid doing strenuous activities until the skin has healed. You should also wear comfortable clothing and continue to wear your moisturizing lubricants until the skin has healed. If you find you are performing an activity that is putting stress on your chafed thighs and causing you additional discomfort, stop what you are doing, carefully wash your thighs and add an extra layer of your ointment. If your chafed skin is not healing or it appears as though you may be developing further irritation or an infection, it is important to visit a doctor. It may be necessary to get an antibiotic cream to help cure the damage that has been done to your thighs. The most important step for relieving chafing thighs is to purchase appropriate clothing for activities that you will be participating in. When you are doing athletic activities, wear clothing that does not hang and move around a great deal against the skin. You also want to make sure that you wear cloth that is soft such as cotton to prevent excess irritation on your thighs. Make sure any clothing that you wear against the thighs is clean and dry to prevent any debris on the cloth from causing irritation to the area. Some athletic stores offer safety guards or specially designed clothing to help you manage chafed thighs. This is a big part in preventing chafing. When you are dehydrated, your skin will be dry and more likely to become irritated or damaged. Staying hydrated during exercise will also help prevent excess sweating that can increase your chance of the skin becoming chafed or otherwise irritated. Drink plenty of water and use a lubricant or moisturizer on your thighs if you notice the skin in this area drying out. While you want to make sure your skin stays moisturized, you do not want your skin to become excessively moist when you are trying to prevent chafing. Not only does damp skin become chafed more easily, but sweat can continue to irritate a chafed area that has already developed. When you finish exercising, change out of your damp or sweaty cloths as soon as possible so they do not have additional time to damage the skin. Those who tend to sweat a great deal around the thighs should apply alum or talcum powder to the area as well. This will help wick moisture away from your skin so it cannot cause irritation. If obesity or being overweight is causing the chafing thighs, then it’s better for you to lose some weight, especially during hot seasons. What you need to do is to eat fewer calories and combine this with other exercise that doesn't make you chaff. Swimming, weight lifting, cycling (for most people), rock climbing, rowing and more are all good choices.